Rocket Zap - iOS Universal — Welcome to the GameSalad forum! Just wanted to let you know about the latest version of Rocket Zap. It’s a Universal app, runs on your iPhone and now on iPad with HD graphics. 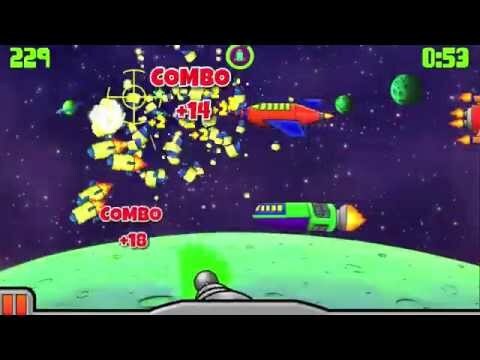 Rocket Zap is an arcade style space shooter game. Destroy waves of Rockets, UFOs and Spaceships. Simple one touch control. Just swipe to aim and shoot. Thrilling chain-reaction explosions add a unique spin to the gameplay. You can orchestrate massive explosions as speeding mini rockets slam into the exploding spaceships. Check out the trailer. Fast-paced fun with no frustration. Jolting explosions with dazzling results. Full-auto laser cannon. No ammo limits. No in app purchases, everything is unlocked. Vibrant hand drawn rockets, UFOs, spaceships and background art. Carefully crafted sound effects. Each sound is designed to captivate, engage and charm. Original action soundtrack, in stereo. Try with your headphones. Looks like a fun game - however, was this created with GameSalad? That does look like an awesome game! I am working on one myself where the weapon would be in the same position as yours and would be able to move like that ...but I can't seem to figure out how to do it If you could help me out with a few pointers it would be greatly appreciated! Its a cool game. Appears to able to be made by GS...inspiring to findout if I could do it. Its an easy 4 of 5 stars.